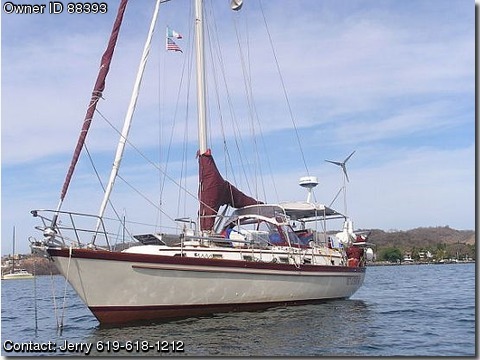 This is a great economical cruiser, AND JUST REDUCED BY $25,100 TO MAKE THIS VESSEL A REALLY ATTRACTIVE BUY! With lots of cruising gear and spare parts, this nicely equipped 385 is clean and ready to go cruising! Also, new teak and holly sole! Newly added equipment New GARMIN GMR 18 High Definition Radar, New Garmin 4012 Chartplotter/Radar Display in addition to the GARMIN 188C, New Bottom Paint. Important Note: All systems have recently been tested and there were no problems. "Detachment" has recently been moved to Barra de Navidad, Mexico (125 miles south of Puerta Vallarta and within 20 minutes of the Manzanillo International Airport. Contact Jerry @ 619-618-1212 SPECS: Builder: Pearson Designer: William Shaw DIMENSIONS: LOA: 38' Beam: 11.5' LWL: 30' Maximum Draft: 5.6' Displacement: 19,100 lbs. ENGINES: Engine Brand: Diesel Engine(s) HP: 50 Engine Model: Perkins 4-108 Engine Hours: 600 TANKS: Fuel Tanks: Alum (new) Fbrgs; 85 Gals Water: Fiberglass; 125 Gals. Holding Tanks: Poly; 6 Gals. ACCOMODATIONS: Beginning forward is a large V-Berth with a hanging locker, 3 large clothing drawers and nice storage for your favorite reading material or miscellaneous items. Just aft is the guest head that can also be used as a large storage area. Moving aft through a privacy door is the salon with 2 straight settees upholstered in off white ultra leather and a center line leaf table that serves both settees. Continuing aft and to port is an excellent custom stainless steel galley. Again, great storage is available in this area. As you move a bit more aft on the stbd side is a stand up/walk through with a nice size chart table and navigation station. Just beyond the navigation station you will find the master suite offering tons of storage, head and separate shower. All finishes are yacht quality. An added feature is a built in tool chest! GALLEY: REFRIGERATION: Adler Barbour FREEZER: Combo STOVE: 3)Burner; Force 10 w/Oven & Broiler MICROWAVE: Yes SINK: Dbl; SS WATER SYSTEM: Pressure H&C; Manual WATER HEATER: 6 Gals.